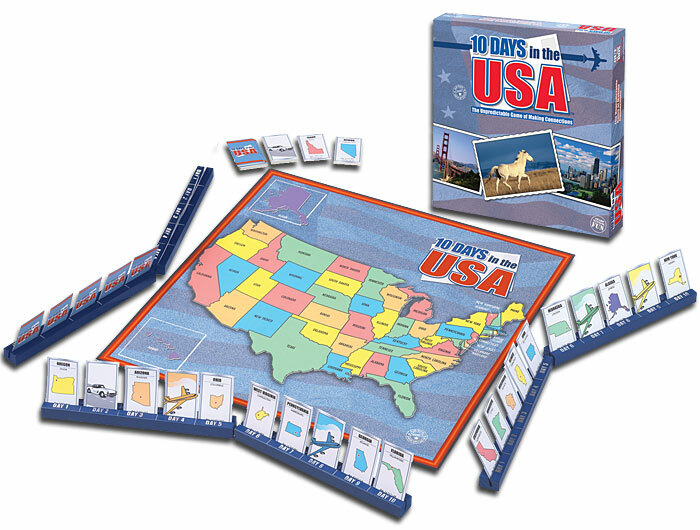 Another destination in the 10-Days Travel Seriesâ€¦ You have 10 Days in the USAâ„¢ â€“ Travel the country by jet, car, and on foot. Plan your trip from start to finish using destination and transportation tiles. With a little luck and clever planning, you just might outwit your fellow travelers. The first traveler to make connections for their 10 day journey wins the game. Fuel up for 10 DAYS in the USA! Other products in the "10 Days in ..." series. This game was such a joy to play with my children (time away from the tv). Not only was it easy to learn, but it teaches you geography in the USA. A++++ game. Remember back in the 70s or what it 80s? When you were learning all the states and capitals? I remember seeing the picture of cars on Michigan, the corn in Iowa, and Mt. Rushmore in South Dakota. Well, this game brings back the memories. I first played it with my 7 year old son. He is quickly learning the states and capitals and also learning about planning and thinking ahead. The concept of the game is to travel from a starting state to an ending state. You can walk to a neighboring state, drive a car through a state to get to a non-adjacent state, or you can fly a plane to any state with a matching color. The game is very easy to learn. There's some luck involved as you have to randomly pick from a draw pile, yet theres a little bit of strategy in planning and thinking ahead. *Hint* The use of 3 discard piles that you can draw from can be used to your advantage. If all you are looking for game that can be played with children or with adults, this is a good little game. Each game lasts about 15 minutes. People often talk about games being useful as educational tools, and this is a prime example. What better way to learn all the states than by playing a game about them? An easy game to learn and to play. It also is a good way to help kids familiarize themselves with the geography of USA. The original of the 10 Days series. It scales very well and turns are very quick, so there is not much down time. This game is a fun, interactive way to learn your US geography. Play is quick and easy but not suitable for younger children as the concepts of the different patterns are difficult for younger children to understand. This has been a big help in learning geography in our family.